The BEST time to get started with essential oils as you get some AMAZING bonuses when you set up your wholesale account. Get Started with your oils before the end of june with some epic bonuses on offer - READ ON... IT's your time! Many people come to me seeking safer products within the home, they are tired of using synthetics, and they are curious and looking for more simple and effective homemade solutions. As a doTERRA leader and wellness advocate it is my role to help make your life a little easier when you start using essential oils. I use essential oils every day for so many aspects of not only my life, but also my family’s life. I have two beautiful children and since becoming a mum have become much more aware of the products we use in our home and also the products we use on our skin. There are so many products out there that are full of chemicals – I had no idea that some of the top household products actually contain ingredients that can be harmful to us. Using essential oils has enabled us to reduce the number of store bought products in our home. I am confident that I am ready for anything now that we have essential oils in our home. So, with that being said, here are some deals on offer until midnight of 30 June 2018 to help you get started with oils in your home! If you want to order this, select the home essentials kit and then add Fractionated Coconut oil to your order. If you want to order this starter kit, select the 'Family Essentials Kit with Smart + Sassy' and add the Petal Diffuser to your order. If you want to order this kit, select 'Introductory Enrolment Packet' from the top menu options and then add 'Mood Management Kit' and 'Petal Diffuser'. If you want to order this kit, select 'Emotional Aromatherapy Kit' from the top menu once you have popped in your details. 4. 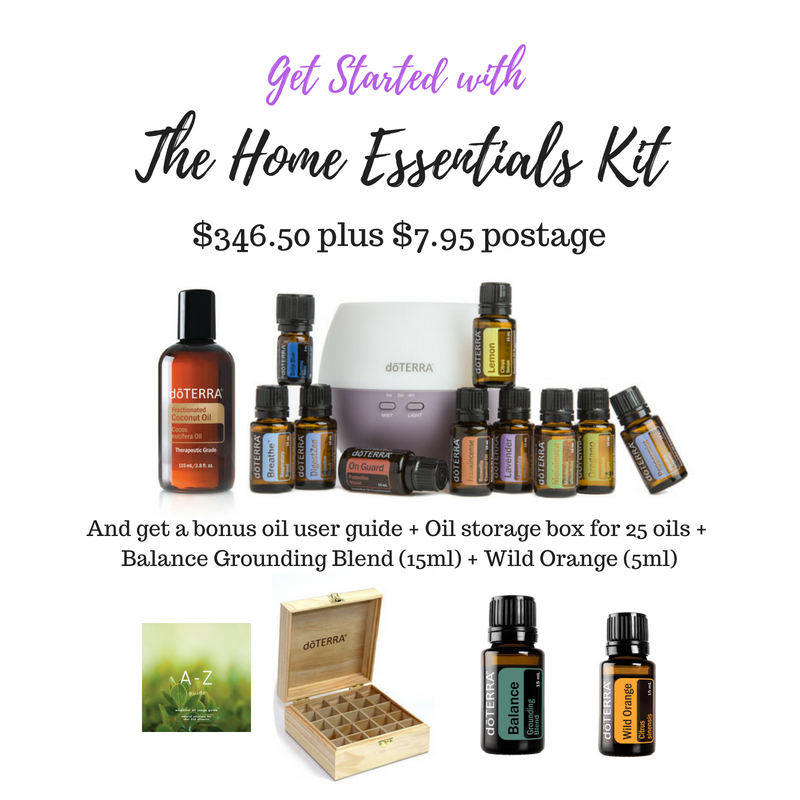 Choose whichever starter kit you feel drawn to (my pick is the Home Essentials Kit + Fractionated Coconut oil as it has everything you need to get started, otherwise select the Introductory Enrolment Packet and add the individual oils you would like to start with). 5. Put in your payment info and your oils will be on their way to you. You will get a confirmation email from doTERRA with your login number and password. Shortly after, I will send you a welcome email with links to our facebook community plus resources to start reading up on while you wait for you order to arrive. Please flick me an email at sarah@theessentialsociety.com.au to let me know you ordered and which kit so that I can get your bonuses out to you! If you get stuck please give me a call or send a text to 0422 095 444. I cannot wait for you to start using these oils in your home and to support you in life!